There is something so joyous about reading poetry to my kids. Each poem, even the short one, is so full. Full of meaning, full of emotion, full of subtext, full of fun, full of thought. I never read poetry to my kids without smiling. It was difficult to narrow this list of great children’s poets down to just 20. I’ve only listed books for the first nine (because I ran out of time! These lists take a lot of time, folks), and then I’ve given you the names of more poets you should look for on your library shelves. Most of these names are contemporary authors, but I’ve thrown in a few classic poets as well. 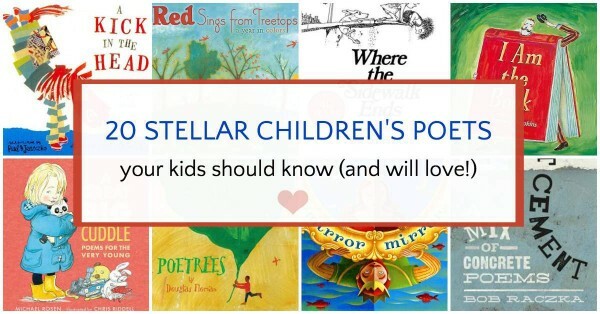 Once you’ve caught the poetry bug, please explore all of my poetry resources for parents and kids. And now, in no particular order… a few great children’s poets your kids should know, and will love! Wet Cement: Concrete Poems. I mentioned Bob Raczka’s latest collection in my newsletter last week (subscribe to my newsletter here) and the next day it arrived on the library hold shelf just for me. If you aren’t familiar with concrete poems, you are in for a real treat. I think they are my 11 year old’s favorite type of poetry because there is a puzzle factor and an “aha!” moment when what you are seeing connects with what you are thinking. This book is entirely in black and white and it is the poems themselves which create the pictures, there are no other illustrations. A marvelous book. Stop asking me to choose a favorite Jack Prelutsky poetry book. Just stop. I can’t! It’s impossible. Whether it is the crazy Scranimals, the imagined creatures in Sardines Swim High Across the Sky or the amusing comparisons in Behold the Bold Umbrellaphant, I love them all. Good Sports is certainly my boys’ favorite! Too numerous to name, just check them all out! Doodle Dandies: Poems That Take Shape. J. Patrick Lewis was the U.S. Children’s Poet Laureate a few years ago and he has written some very inventive poems, as well as curating some wonderful collections, like the National Geographic Book of Animal Poetry: 200 Poems with Photographs That Squeak, Soar, and Roar! Where the Sidewalk Ends. Do I really need to tell you about the poet who put children’s poetry on the modern map? Every household should contain a copy of A Child’s Garden of Verses. There are several different illustrated versions. I love the Tasha Tudor illustrations and this one with illustrations by Gyo Fujikawa. Marilyn Singer’s reverso poem books should be on your must read list. There are three of them now, such as Mirror, Mirror. Check them all out! Meet Danitra Brown is just one of the poetry books by Nikki Grimes, whose talent also extends to picture books, early chapter books and novels! Douglas Florian’s whimsical and clever picture book poetry, such as Poetrees, is great for kids who don’t yet have a lot of exposure to poetry, as well as for us old hands. He has a number of themed collections, so there will be something for everyone. I hate to say it yet again, but it is difficult to single out a book to feature by Joyce Sidman, but start with Red Sings from Treetops. Sidman’s poetry centers around nature and her books often include facts and narratives about her subjects. Try our poetry reading challenge: guaranteed to make you a total fan of poetry! Subscribe to our newsletter and be the best-read parent on the block. Add Charles Ghinga. I just shared “What Is A Poem” from his Fury of Motion: Poems for Boys with the children at Kapaa Elementary School. Thanks for sharing your recommendations. I can’t list everyone, so I’m glad you chimed in. I absolutely love your lists! I think you pick out great books and I would love to see you continue! But I have one request. Could you possibly make a strictly Middle Grade/Young Adult nonfiction book list? I love nonfiction and I think it would be great to get your opinion on some good books. Otherwise, keep up the good work! Thanks for the suggestion. Hopefully I will find time to get something put together in the future. Have you ever heard of Kenn Nesbitt? His books are great for school-aged kids and very funny. Each poem has some sort of unexpected twist at the end that you didn’t see coming. He is from Spokane, WA and you can find his books on Amazon. I’m checking my library for some of these right now! We love Shel Silverstein, and the classic nursery rhymes, but haven’t branched out much beyond that. Thanks for these suggestions! AA Milne is a classic! We love the book The Adventures of Isabel by Ogden Nash. Such a fun read! Eloise Greenfield! She is essential!!! !